until 2016, grand cafe in s. minneapolis was a solid neighbourhood spot. i ate there one time with friends, liked my meal but mostly liked that the restaurant was not charging outrageous prices for food that was decent but nothing very special. a little after that there were big changes at the restaurant. new chefs moved in: jamie malone and erik anderson, a pair of local darlings who had been rumoured to be opening their own restaurant for years. the menu moved in a far more haute direction and prices went up. eventually anderson left to helm coi in san francisco, leaving malone in charge. the restaurant has continued to receive plaudits, and malone was recently nominated for a james beard award (for the little that's worth). and so we finally decided to check it out. we ate dinner there this past saturday and thought it was the best fine dining meal we'd had in the cities for a while. herewith the details. I was trying to remember what the highly rated (was, anyway) Minneapolis restaurant in the big old bank was called. doesn’t the cafe bolud guy run the only restaurant in the whole state? yes! his tater tot hotdish casserole is amazing! I love his walleye pecan crusted steak. I checked yesterday, and the walleye with pecan frangelico sauce is still on the menu at the St Paul Grill. I wonder if they have refined the dish over the last twenty years. 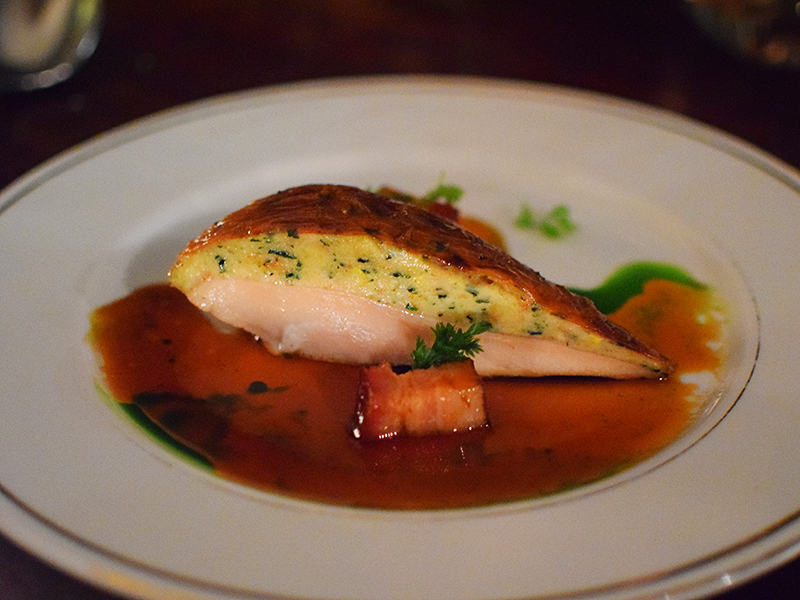 There's walleye (ok, Sandre) on the menu at Frenchette often these days, but they fail to properly crust it. And how's their Frangelico cream sauce? i do hope you realize that the restaurants that still inform your sense of twin cities fine dining have their analogues in new york too. meanwhile, the menus of the places that have sprung up in the last decade or so are mostly indistinguishable from their new american peers in new york. But I did think it was funny that Grand Cafe has a menu item called "hot sampler." yes, but what is the relevance of those memories to a discussion of current twin cities fine dining? also, where on the grand cafe website are you seeing a menu item called "hot sampler"? Withdraw the latter. Was getting my websites mixed up. It is. Three months of misery. I was sick and not very happy. Sorry. I can not respond on these threads any more.